We live in a culture where there is so much instant gratification that some believe anyone can achieve instant gratification if they just have enough faith. while leaving out the preceding verses where God explains that His plan includes 70 years of captivity to Babylon. When the verses are read together, you realize that God’s loving plan may include gratification delayed until Heaven. Real faith isn’t built by instant gratification. Real faith stands the test of time. Real faith holds on to the belief that God is good when its circumstances are not. When wounded and weary, real faith rests. When left in the dark, real faith looks up to the One who made the stars and waits. Real faith obeys God even when it looks stupid to others. Real faith trusts in a God that collects each tear in His bottle. When you are in a valley, you are especially vulnerable to attack. You need to know what real faith looks like so that you can endure. If you believe it looks like instant gratification, you are going to be attacked by guilt and condemnation when it doesn’t work out that way. The Bible is honest about life and full of stories that are messy and hard and require endurance. Not every hard thing in the Bible was avoided by faith. Even Paul couldn’t pray the thorn in his flesh away. Some things are just difficult and painful and faith doesn’t make them hurt less. My life in this valley is messy and hard right now. It’s difficult to paint a true picture… for the most part there just aren’t any words. I have a deep desire to share authentically because I believe that stories tidied up and wrapped in a bow can destroy those who are suffering with guilt, condemnation, isolation and shame. Real stories don’t always have commercial breaks or superficial Hallmark endings. I’ve been in this painful valley for a little over a year now. There is no tidy bow. I am still struggling, but I keep looking up to the same faithful Savior. In Exodus 14 God lets Moses in on His plan to place Israel in a vulnerable situation, harden Pharaoh’s heart, and entice him chase after them so He could gain glory for Himself and show the Egyptians that He is the Lord. His plan was FOR the Egyptians. I love that He does things not only for us, but also for those who desire to kill or enslave us. I love that he hardens the hearts of pharaohs, so He can show many hearts His glory. I hope that God will use this very vulnerable place that I now find myself in for His glory, too. God had shown Moses a plan and purpose for putting Israel in danger, and Moses understood that it would be for God’s glory. Moses didn’t know what God would do next, and yet he responded to Israel’s fearful cries with extraordinary faith. 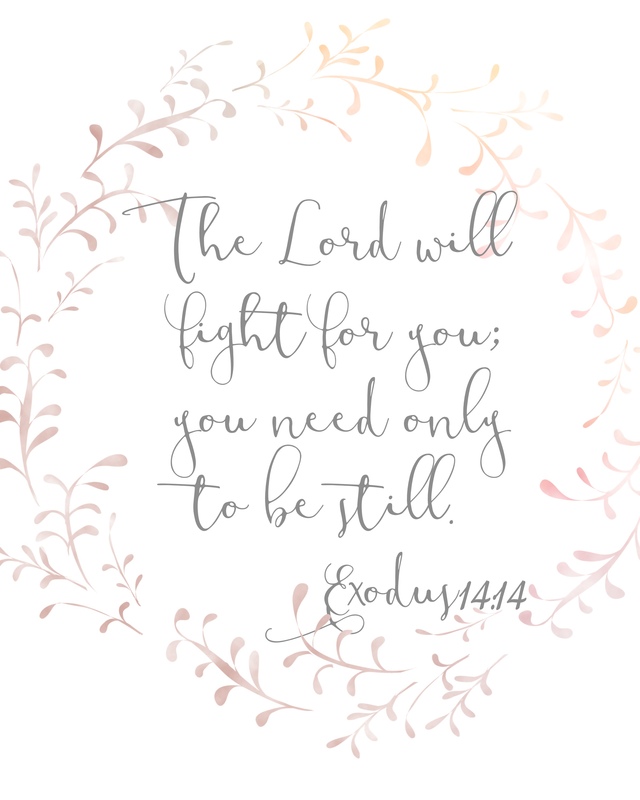 It has been a word in due season that has strengthened and encouraged me when I couldn’t do much more than “be still” for months while I allowed my body to heal. I’ve spent a lot of time being still before the Lord this past year as well. After loosing Joel on December 7, the 7ths became Exodus 14:14 days for me. I’ve learned that I have to be especially nice to myself on the 7th of each month; I have to be still and let the Lord fight for me. I have prayed for help, wisdom, comfort, and healing. I have been still in His presence waiting for His direction and answers. I have been obedient in what I have known to do to the best of my ability. This past Thanksgiving, the kids’ favorite holiday, was our last “first” without Joel. Then came the first anniversary of Joel’s Homegoing. Joel spent most of his last earthbound day at “home” with me studying for finals, talking to me, and playing his guitar while I put up our Christmas decorations. Putting up and taking down Christmas decorations now means reliving that last day. It was really hard, but I was determined to be thankful for all the days we had with Joel and not to dread Christmas. I don’t want to dread Christmas. I love Christmas. I love that Jesus became one of us so that He could show us His love for us on the cross. The wreaths, trees, lights, candy canes and nativities all comfort me. The 175 of names of Jesus on my Christmas tree comfort me. I love being surrounded by reminders of His love for me. Most of all it comforts me to remember that Jesus drew us to Himself before Joel lost his life… that Joel is now in Heaven seeing Jesus face to face. We are blessed. It all comforts and pains me. Not having Joel Manuel here with us, not having him come in the kitchen and see how Christmas lunch preparations are coming, not having him help set the table, not having him sit and eat with us, not having him play games with us is excruciatingly painful and rightfully mourned. Although I had managed not to dread Christmas, I found myself running into my closet several times on Christmas day to let out deep, sorrowful screams into my pillow. A few days after Christmas, we took a weekend trip to a place we had taken Judi and Joel just 4 years before. We made it through remembering/imagining seeing Joel just around the corner there. Then a friend lost their daughter. We spent New Years Eve grieving for her and her family and for Joel and for the new year we had to spend without him. Judi turned 20 on the 4th of January. She is now the age Joel was when we lost him last year. We made it through all of it with joy and hope and sorrow and tears. My heart counts the 7ths involuntarily. The 7ths are still Exodus 14:14 days for me. I don’t know how long this will last. I chose in the middle of this discovery to be still and to be obedient to breathe even though it HURT, and though I was deeply disappointed and ashamed that it was all I could be obedient to do. This week, I heard a message that taught that being still wasn’t enough, that Moses was rebuked for telling the people to be still, that being still wasn’t acting in faith, that instead of being still Moses should have moved. I was crushed. Was there something I was missing? If I had enough faith, could I just walk out of my valley? I decided to reread the context for myself and I understood something for the first time that really encouraged me. God’s response was to Moses. There is no record here of Moses crying out to God in unbelief or fear. Moses’ FAITH was what cried out to God. His command to Israel to be still spoke louder than all over one million Israelis’ cries of terror. I believe that God’s question was not a rebuke but a deep emotional response to Moses’ faith. FAITH IS WHAT REALLY MOVES GOD. Moses didn’t know the plan for escape. He had never seen a sea parted and dry land appear. Where was he supposed to move to? He only knew that God was good and sovereign and had a plan. He believed that God would show him what to do next if they could stand firm, be still and wait on the Lord. It was a stance of trust in the face of certain death for a over million of God’s people. God invites us to cry out to Him in faith for wisdom when we are in the midst of trials (James 1:2-5). He will not rebuke us. He delights in showing Himself strong in our weakness and in coming to our aide. God’s deepest desire is for relationship with us. He proved it in the extravagant act of giving His ONLY begotten SON for us. God put His own Son in a vulnerable place so He could show us His glory. Relationships require faith, trust and vulnerability. If God had only wanted obedience, He would have never sent Jesus to die for us. He would have laid out the whole plan for Moses in verses 1-4, Moses would have parted the sea and the Israelites would have walked straight through. Instead, He tested Moses’ willingness to trust Him in a very vulnerable place. And if such a thing were possible, I believe that Moses’ faith exceeded God’s expectations. To say that Mike and I don’t know or understand all of God’s plan, would be a huge understatement. We don’t understand why God allows so much pain and suffering in us (personally or collectively in the human race). We only know, as the meaning of Joel Manual Coleman’s name proclaims, that God is sovereign, that God is with us and most importantly we know that God is good. We are waiting on the Lord and obeying as He gives us grace and instruction. Holding on even when that grace and instruction is only to stand still.. to breathe.. and wait for Him to fight for us. We are standing in faith even when that instruction is to wait in a vulnerable place where we feel like God could have come up with a better plan. We have a long way to go, but we are trusting that He is the “author and perfecter of our faith,” that at the end of our race we, too, will see Him face to face. If we hear that longed for, “Well done, good and faithful servant” as He wipes away our tears, it will be because He has been faithful in us and found glory for Himself through saving us. At last, we will hug our Joel and sing and dance with him in a triumphal song of praise for all God has done for us and because our last enemy, Death, has been swallowed up in His victory. jenny, I have been praying for you faithfully. this is becky gaston. I had to post anonymously, as I have no reference to the other options. I thought about you and prayed for you and cried for you during the holiday season this year and I will continue to do so. We serve such a beautiful God and have such a rich heritage!